oxygenation, detox and lymph drainage,spinal alignment, mental focus, improved circulation, energy andsteady weight loss. Temporarily relieves musculal aches, pain and tension caused by fatigue or overexertion. Temporarily increase local blood circulation. simply it can help you relax and fell good. The original Sun Ancon Chi Machine is the result of 38 years of medical and scientific research by renowned Japanese scientist Dr. Shizou Inoue. The Chi Machine enables the human body to gently move from side to side in a figure of eight (the same way a goldfish swims), maximizing the body’s natural absorption of oxygen, using all the movement orbits of the human anatomy. This movement may be compared to a masseuse holding your ankles and swinging you from side to side after massage. the green logo on the front of the unit and on the timer, it is a fake! and the original Chi Machine known as the Sun Ancon, sold exclusively by HTE. No stress. No pain. No drugs. No more excuses – simply lie down and relax. Health is daily MOVEMENT, which creates OXYGENATION and DETOXIFICATION. Oxygenation and detoxification of the body only happens through physical movement and are the reasons we are advised to exercise so that the body functions at peak performance, thereby making it harder to age and to ‘break-down’ due to inactivity, poor diet, negative energy, emotional issues, toxic medication, EMF’s and environmental pollution. Oxygen deficiency of the body is the proven foundation of multiple illnesses and diseases. Bacteria, viruses and parasites are destroyed in the presence of oxygen, especially cancer. The Sun Ancon Chi Machine aids in maintaining physical wellness and thus the prevention of illness and physical disorders by maximizing supplemental oxygenation of your entire body at cellular level via physical stimulation i.e. Passive Aerobic Exercise. Without daily physical movement the Lymphatic System cannot detox your body. Aerobic exercise oxygenates the tissues and moves the lymph around. Lymph is a colorless fluid that bathes every cell in the body. The body has two circulatory systems, one for blood and the other for lymph. Blood is circulated by the heart, whereas the lymph is circulated by physical exercise. Many tissues depend on the lymph to provide nutrients (including oxygen) and carry off wastes. If the lymph does not circulate then the tissues suffocate while stewing in their own acidic waste products (uric acid, lactic acid etc.). – Extract from Acid and Alkaline Food. Fascinating evidence how the Sun Ancon Chi Machine benefits the human body, reflected by changes in the human aura. 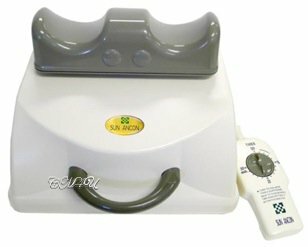 Health care professionals – Masseuses, physiotherapists, doctors, clinics, chiropractors, day spas and athletes in the USA, Canada and Australia, are utilizing the Sun Ancon Chi Machine’s relaxing, de-stressing, healing, detoxifying and oxygenation benefits in their daily life and business practice. Thousands of people across Asia, Australia, Canada, USA, Mexico, Europe and Scandinavia use their Chi Machine on a regular basis with remarkable results being reported consistently, spanning over 20 years. broadcast across USA, Canada and Europe – the Sun Ancon Chi Machine, every home should have one. Keep fit in comfort of home. CRITICAL for daily cell detox. HTE has exclusive rights worldwide. Other ‘Chi’ machines are imitations. Precise Oscillation – one set speed: The machine has an ankle cradle on the top which oscillates (moves side to side), at approximately 140/minute – a multiple of the average pulse rate (72) and the cerebro-spinal pump rhythm (12) synchronized with your heart rate, blood pressure and spinal alignment – creating a balanced, rhythmic, relaxing wave-like motion throughout your entire body, thereby oxygenating every cell and tissue via blood circulation, thus enhancing your metabolic rate, aiding detoxification via the lymphatic system, and aligning your spine. ranks among the lowest. The Sun Ancon Chi Machine was created in Japan. Multiple Global Patents – over 5 million Sun Ancon Chimachine units have been sold worldwide since 1990. Recognized and registered as a Medical Device in Japan, Australia and Canada. FDA Regulated as a Class 1 Therapeutic Massager in the USA. Highly rated by hospitals worldwide as an important clinical, medical and health maintenance unit. ITS ALL ABOUT MOVEMENT OF THE BODY! Physical and mental oxygenation increases your energy and focus, raises your metabolic rate, improves your blood circulation and activates lymphatic system detoxification. The mind moves into alertness and mental focus. The very specific one set speed and figure of eight motion of the Chi Machine aligns your spine, regulates body functions and relaxes your body without any stress or effort. Your natural Chi (life force energy), is stimulated and enhanced and the brain moves into an Alpha state which thereby creates a peaceful, meditative state of calmness, mind/body healing and wellness. The Original Sun Ancon Chi Machine.Goldfish Position: Arms relaxed by your sides, palms down. Particularly good for releasing tension and relaxation. Reduction in muscle soreness, tension, stiffness, body aches and pains. Improved flexibility of muscles and joints, more limber – spinal alignment. Improved function and regulation of internal organs and body systems. Improved circulation of the blood – activated lymph drainage and detoxification. Alleviation of stress related conditions – headaches, anxiety, depression. The brain shifts into a relaxed Alpha brainwave state – mental calm and focus, physical relaxation. Steady weight loss correction if under or over weight, or menopausal. Sound, restful sleep – increased energy, a wonderful sense of well-being. Lack of movement and lack of oxygen results in minor to chronic Illnesses. Cells becomes cancerous when they receives less than 60% of their oxygen requirement. 75 trillion cells provide your body with the energy to carry out every brain function, body movement and the needs of all your body systems and organ functions. Each cell has only two requirements to produce this energy: a) Nutriment from food intake and b) Oxygen – Exercise (physical movement) fuels the body with oxygen which in turn carries nutrients to the cells. Immune deficiency, cardiac symptoms, sleep and respiratory disorders, blood chemistry disturbance, anxiety, intestinal problems, depression, headaches, fatigue, stiff neck, shortness of breath, dizziness and cancer. Otto Warburg, a two-time Nobel Prize winner, showed that the cause of cancer, is the replacement of the respiration of oxygen in normal body cells by a fermentation of sugar. Simply put,cancerous cells cannot develop in the presence of adequate oxygen. The Original Sun Ancon Chi Machine is for virtually everyone including extremely busy people, children, athletes, construction workers, military, office workers, drug rehab, the physically challenged, and senior citizens. The Chi Machine ‘work-out’ is done lying down with no pressure, stress or tension applied to any part of your body. NO risk of injury. Heartbeat and blood pressure do not increase. NO stress to your spine, heart, muscles, ligaments, joints or lungs. Excellent benefits for the frail, physically challenged, seniors, wheelchair bound or bedridden. Do you wake up tired, even after eight hours of sleep – sleep restlessly. Do you suffer from chronic fatigue – have poor physical endurance. Do you tend to be moody, irritable, tense, on edge. Do you suffer from allergies or asthma – susceptible to colds and flu. Do you have frequent pain in your shoulders and/or back. Do you have weight problems. If more than 3 of the above apply to you, your body is oxygen depleted. Emotional stress and largely sedentary activities contribute to chronically low levels of oxygen in your cells. Low oxygen levels will leave you feeling tired and depleted. The most effective way to acquire sufficient amount of oxygen is to exercise – to get your body moving – but many people find exercising tiring, exhaustive and time consuming. Long-term consequences for not exercising can prove to be miserable. Use of air conditioning and heating equipment causes the weakening of skin and lung function. Smog, contaminated water supplies, contamination by agricultural poisons, noise increase. Increased height and density of surrounding concrete building structures and power lines. Food additives, medical or street drugs, alcohol, cigarettes or cigars. Cell phone use which has proven to be physically and mentally harmful. Rich gourmet food, fast food, processed food, – overeating combined with little or no exercise. All of the above factors rapidly cause the quality of your daily living environment to worsen and the quality of your health to decline. The Sun Ancon Chi Machine counteracts all these environmental poisons and toxins by detoxifying, stimulating and rejuvenating your oxygen depleted body. Bacteria, viruses, parasites and malignant tumors all thrive in a low oxygen environment. all disease.” – Dr. Shizuo Inoue, medical visionary and Chi Machine conception. An effortless, sweatless ‘work-out’ for the entire body, regardless of age, health or fitness level: Simply lie down and relax. The machine is frequently used for warming up, enhanced athletic performance and metabolic rates, mental focus and the painless release of lactic acid when used to cool down after dance, athletics, martial arts or yoga. This position creates traction throughout your whole body helping to relieve muscular tension and discomfort. Lose weight steadily without hours in the gym and meals of only salads and diet pills. Weight loss will tend to stay of longer if you use the Chi Machine on a consistent daily basis. Fat deposits and cholesterol are consumed through metabolic processes. The machine may also aid in the control of weight gain in your upper abs due to menopause hormonal changes, providing you use the machine consistently. The Chi Machine does NOT exercise or build muscles, but oxygenates them. With daily use, the Sun Ancon Chi Machine brings your body back into balance and alignment naturally. Working at cellular level, it triggers cellular memory, so if you are under-weightyou will gradually put on weight and if you are over-weight you will slowly but steadily lose weight. By using the machine and following a healthy, nutritional, alkaline diet your body will adjust safely and naturally. Uninterrupted peaceful sleep and a level of fitness, productivity and energy, you may not have experienced in quite a while. Mentally de-stressed and relaxed, physically revitalized and rejuvenated, thousands of owners have reported their physical pains either disappearing or being greatly reduced and dissipating as they continue using their Chimachine on a regular basis. Countless users have reported dramatically cutting back or quitting prescribed medications of their own accord due to improved health status.